Qari Is’Haaq is the founder and Director of National Huffadh Association UK. He has studied Tajweed and Qiraa’ah in Egypt & Morocco and is currently studying the Saba’ Qiraa’ah (7 Different ways of recital). He is a qualified Teacher and has vast experience of teaching in a school setting and currently is the Humanities and Head of Learning Year 8 at London Enterprise Academy in London. Also, Qari Is’Haaq has successfully completed an LLB (Hons) Law degree at the University of East London and undertook the Legal Practice Course at Leeds Metropolitan University. He is a qualified Solicitor by profession and memorised the Holy Qur’aan by the age of 11 at Quwwat ul Islam Masjid, London. 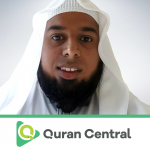 Qari Is’Haaq currently is a part-time Imaam at London Islamic Cultural Society in North London. He has also been invited to lead the Taraweeh prayers in Jordan, India, Morocco & Germany. Furthermore, he has taken part in various International Qur’aan Competitions around the world, notably in: Egypt, Croatia, India and Morocco, in which he has represented the UK. He has deep passion and love for The Qur’aan and is always involved in organising Qiraa’ah events in London with International Reciters. He is a TV personality too; Qari Is’Haaq appears regularly on the Recite! show on Islam Channel, one of the judges for Eman Channel Ramadan Juz Amma Competition and was one of the head Judges for the IQRA TV ‘Q Factor’ National Qur’aan Competition. He is actively involved in organizing and judging other Qur’aan competitions across the UK. He has also recently established Quraan Movement UK, which is an online platform, aimed at involving youngsters and spreading the love of Qur’aan. May The Almighty accept and take more work from him. Aameen.